Now regarded by taxonomists as a highly modified individual hydroid (Chondrophore), rather than a colony of specialised individuals, such as the Portuguese-man-o-war, it floats or ‘sails’ around warmer seas in both the Northern and Southern Hemisphere. The invertebrate is described as “an upside-down polyp of a hydrozoan which did not settle to the bottom and grow sessile, but instead settled on the surface of the water and grew a float”. 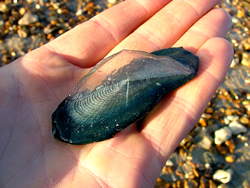 The disc-like float, with cellophane-like appearance and texture, can reach up to 10cm across and the hollow feeding hollow, often a deep blue in colour, hang a few centimetres below. The tentacles having stinging cells which catch small prey just below the water surface including fish, copepods and other zooplankton. There are dimorphic forms with different orientations of the sail. If the sail is orientated NW-SE it sails with wind on its left, whereas the other form with sail orientated NE-SW sails with wind on its right side. While mixed populations can be found, most strandings on UK shores are ‘lefties’, whereas the right sided form is commonly seen off the Atlantic coast of North America.